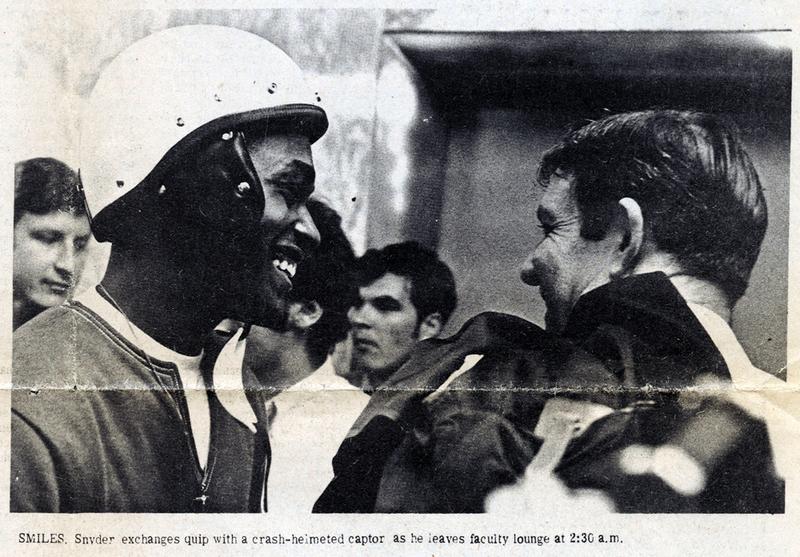 Indiana University Acting Chancellor John Snyder smiling with a student at the end of the Ballantine lock-in on Sept. 5, 1969. /Photo courtesy of the Indiana University Archives. When it comes to Indiana history, James H. Madison is the man to see. After 40 years studying the state’s history, the well-known author and Indiana University professor emeritus says not much takes him by surprise. While writing his latest book, Hoosiers: A New History of Indiana, Madison spoke with dozens of experts to gather all he could on the nearly 200-year-old state. After talking to Madison and reading his new book, 812 has come up with eight things you probably didn’t know about Indiana’s history. 1. Many of our state’s early pioneers were African American. 2. We almost fought for the Confederacy. Not all Hoosiers were enthused about fighting against the South. Some Hoosiers were opposed to President Lincoln and the Union, and formed their own companies and militia despite living in a predominately anti-slavery state. “Of all political difficulties Indiana has had, nothing matched that of the Civil War,” Madison says. 3. Lincoln is, in fact, ours. “No matter what they tell you, Lincoln is ours,” Madison says. He argues that although Lincoln was born in Kentucky, he spent his most formative years (7-21) growing up on the Indiana frontier. Madison says that Lincoln’s greatest attributes—his thinking, reading and writing—were developed in the Hoosier state. 4. Our ancestors weren’t so different from us. 5. Indiana was a melting pot of cultures and beliefs. A movement in the early 20th century aimed to do away with religion in Indiana. These people, called freethinkers, didn’t believe in religion or God. “A whole range of cultures, beliefs and lifestyles were represented in one state,” Madison says. 6. Upheavals in the 60s didn’t miss the Hoosier State. The protests of the 1960s over civil rights and the Vietnam War were as prominent in Indiana as they were in rest of the country. “The Ballantine Lock-In” of 1969 aimed to protest rising tuition fees and civil rights issues. Students blocked the exits of Ballantine Hall, locking in administrators until a meeting with the Board of Trustees was called. Keith Parker was also elected student body president in 1969. Parker was a member of the Black Panther Party, and supported student nonviolent protest. 7. Indiana was the first to convict whites for killing Indians. Like most states, Indiana struggled with violence between Indians and settlers. In 1824, Indiana made history by being the first state to legally execute whites for the murder of Indians. Madison attributes this movement to the Indiana frontier’s nobility of justice, and desire to discourage further violence. 8. The Midwest began here.